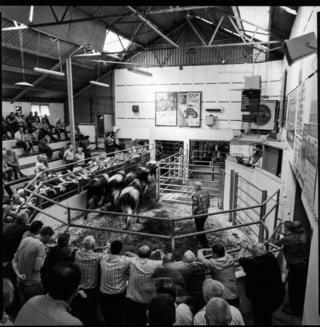 On the fringes of West Cork in Ireland, Bandon's weekly cattle mart provides a source of commerce and social engagement for the market town. Every Monday, the market becomes a hive of activity as farmers from the surrounding areas gather to do business and to catch up with friends. It's a family occasion too; parents bring their children, often as an informal apprenticeship to the farm trade. Photographer Damian Drohan captured the hubbub, providing a revealing and atmospheric look at this microcosm of rural Ireland. It's Monday morning, around 11:30, and the car park is filling quickly. There is a cacophony of noise, almost like the mustering for battle. Cattle bellow, instructions are shouted back and forth; everywhere the beeping of reversing vehicles, cattle trucks, 4x4s and cars can be heard. Calves, cattle and sheep are cajoled from trailers, while two young men confidently apply glue and numbers to the shanks of the livestock. As I approach the side entrance, the foreman regards me with curiosity and wariness. I proffer my hand, which is engulfed by a huge, work-hardened hand in return. "Tom said it was OK - I'm just doing a few photographs round the mart." That is enough for him. He stands at the doorway to his small office, his posture relaxed but assured. I take three quick pictures. I make my way through the crowds. The atmosphere is excited and hectic yet good-natured. The assembly hall is cavernous, reverberant and, at this early stage, pristine. There is a gangway that spreads in four directions with six or more entrances and exits. The platform vibrates with the weight of many feet. Here and there are small clusters of men, women, boys and girls. Backs are slapped and friends are greeted. Below me, cattle run along the passageways between pens. Buyers and sellers wander the length of the hall, stopping for a second glance at potential purchases or the competition. At the top of the hall is the entrance to the auction room. Stone and wooden benches are arranged in a horseshoe shape, reminiscent of a small gladiatorial arena. The salesman musically and rhythmically shouts numbers at a speed I can't decipher: "940, 50, 60, 1,000..."
The pace slows, then pauses, and the salesman looks to the owner, who stands nervously in the ring, circled by his prize livestock. The owner shakes his head. The ring men hustle the young bull out of one gate, while three heifers are hustled in through another, and the cycle continues. I grab some photos of the action, hoping I won't regret the decision to shoot film with a 6x6 camera in this heavily shadowed space. Down a corridor is the canteen, which bustles with customers eating plates of roast dinners, gravy, carrots and mashed potato. There are also soup and sandwiches. Nearby is a battered metal gate on rusty sliders. It is a good spot for an ad-hoc studio; I've always found it easier to ask people to stop for a portrait when my camera is stationary, and the space becomes mine for the 20 minutes that I stand there. As the market draws to a close, I happen to see the manager, Tom. Built like a shed, Tom's a youngish 40, dark-haired and with a broad smile. "No bother, come back next week if you feel like it," he says. I return to my car, laden with gear like a packhorse, tired and pleased after the day's excitement. All photographs by Damian Drohan for multimedia project The Mart. Commissioned by Cork County Arts Office, The Mart was originally exhibited in a site-specific installation with films, portraits and reportage.